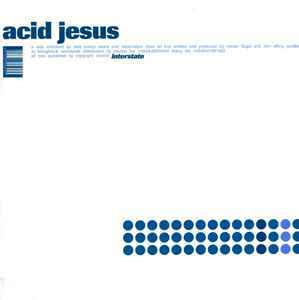 A favorite from Acid Jesus! Thats a really great review Westpfalz-Johnny. The Interstate EP is one of my favorite 12" ever. I've used and abused my copy sadly, I had a use for this track in nearly everything. Usually as a nice intermission breakdown between electro / techno conversions in a set as i generally tend to go ambient by the end of sets to smooth things out and make people listen and think. Interstate is a really intelligent use of electronics, and atmosphere, and delicate sounds and minimal bass and yet quite slamming snappy percussion. It's one of those tracks you want to listen to when you need clean, minimal, frosty and crisp sounds while working or whatever. It is a true shame Alter Ego had to pioneer that fashionable electro punk movement with Rocker which nearly every vulgar copy-cat has mimicked and copied ever since. Now all the clothing in the clothing stores is modeled around this style, terrible hot pink stripey shirts and hooded jackets, absolutely disgusting. Acid Jesus and Alter Ego were true pioneers I really wish they stayed on their path as they were onto something really good and it touched me deeply. Interstate is one of the most brilliant and 'intelligent' tracks I´ve ever heard. Based on a very light but striking groundconstruction the listener will feel himself like he stands on an airport directly under a landing Boeing 747 - the cult-character of this record is ungradable high! Not to forget the expression of Sven Väth when he played it on the radio: "Flughafen Frankfurt Main"!!! Some people in germany call this record just the "Airport-Record".